Situated right in the far south of Thailand, close to the border with Malaysia, is the city of Hat Yai. Although nowhere near as large as Bangkok’s population, Hat Yai has a big urban area that makes it the largest metropolitan area in the south, and the third largest in Thailand. So, if Hat Yai is such a big city, why would you want to travel here from Bangkok? Well, Hat Yai is famous for its shopping, whether its department stores, malls or markets, there’s something for everyone, and, no Thai city would be complete without some great temples too. Options for Travel from Bangkok to Hat Yai? If you’re not fussed about getting off the beaten path and want to travel from Bangkok to Hat Yai, there are lots of different ways to make this trip. Before deciding, you should know that it’s close to 1000 kilometers (around 600 miles) from one city to the other, so it’s a lengthy journey, but the good news is that there are flights available if you’re pushed for time. For travelers with ample time on their hands, the train is a great option, plus there are buses and minivans traveling this route too. Read on to find out more about each of these options. As mentioned above, it’s over 900 kilometers from Bangkok to Hat Yai, so if you’re hoping to travel by train, be prepared for a long journey! There are several different train options, with the journey time varying between 14 and 18 hours, and on each train you also have the option of deciding which class of carriage you’d like to travel. If you’re really trying to save your money, you could buy just a seat within the Second Class section but seriously think about this as the seats are not especially comfortable and you’ll be sitting in it for a very long time! Taking an overnight train and making use of a sleeper carriage is a far better idea. This way, you’ll get to enjoy the views out of the window as you make your way south through Thailand, but when you need to sleep you can stretch out on your bed. There’s a variety of options when it comes to the sleeper carriages; there’s first class and second class but you can also choose between an air-conditioned carriage or one with fans. You may be tempted to go with the air conditioning but to be honest, these are so cold that a fan would be better. Another option, if you’re a female traveler, is to book a ladies only sleeper; great if you don’t fancy being in close proximity to lots of male strangers! 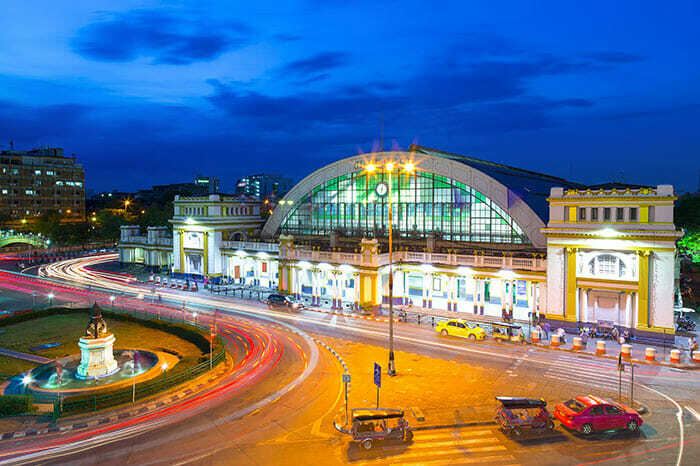 Thai Railways operate the trains from Bangkok to Hat Yai, and they depart from Hua Lamphong Station in Bangkok, arriving at Hat Yai Railway Station which is right in the heart of the city. Most trains depart from Bangkok in the early afternoon, arriving in Hat Yai early the next morning. 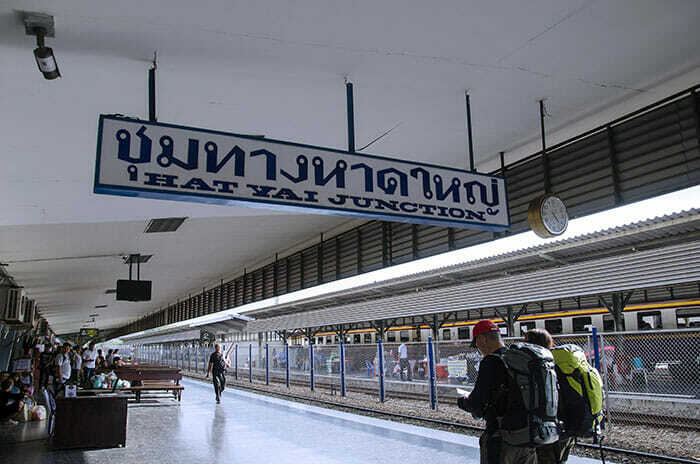 These trains take between 16 and close to 18 hours, however, there is a faster train that departs Bangkok at 10.50pm and arrives in Hat Yai around lunch time, but this gets booked up a lot quicker than the other options, so be sure to book your seat or carriage in advance if hoping to travel this way. From the Southern Bus Terminal in Bangkok you can catch many buses down to Hat Yai. Buses are faster than trains, with scheduled travel times of between 13.5 hours to nearly 15 hours, although it’s very common for them to arrive 1 or 2 hours earlier than scheduled. Generally buses are cheaper than the trains. There are a few different bus types: Express is the more basic and cheapest, then VIP, and sometimes VIP 24 are available. The latter are the most expensive but for the extra money you’ll benefit from better comfort levels and service, and more space to stretch out if you’re hoping to sleep. Tour companies to choose from include Siam Lane Tour and Piya. Faster still, is a van from Bangkok to Hat Yai. This should be the quickest way to travel by land, and is a little more expensive than the buses. However, you’ll be missing out on onboard facilities and services traveling by van, and it is not necessarily any more comfortable than a bus seat. Now to the fastest and generally most expensive way to get from Bangkok to Hat Yai, by plane. There’s no doubt that this is a great option for tourists who have a little more money to spare and who want to get from A to B as fast as possible. Funnily enough, in reality, the flight from Bangkok to Hat Yai is not really much more expensive than the railway; in fact, a first class sleeper carriage costs more than a flight! This is because this particular route is served by several of Thailand’s low-cost airlines so there’s competition between the airlines to offer cheap seats, hence keeping the ticket prices low. 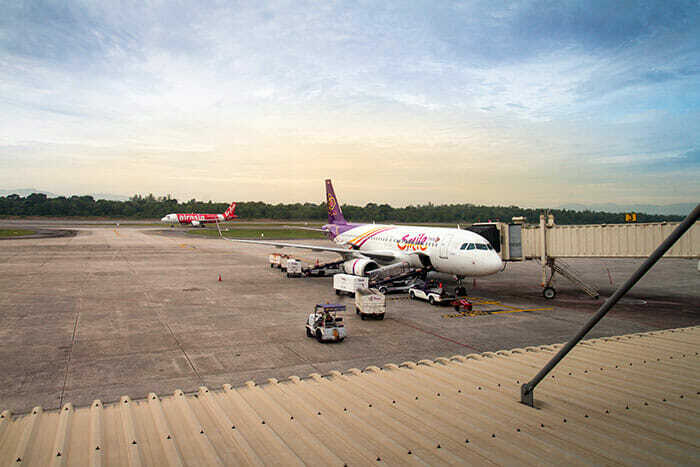 Most flights to Hat Yai depart from Bangkok’s Don Mueang Airport, and the flight takes around 1.5 hours. Airlines include Nok Air, Thai Lion Air, and Thai AirAsia, departing at numerous times throughout the day. Thai Smile is another option, and their flights depart from Bangkok’s Suvarnabhumi Airport instead so may be a little more pricey. 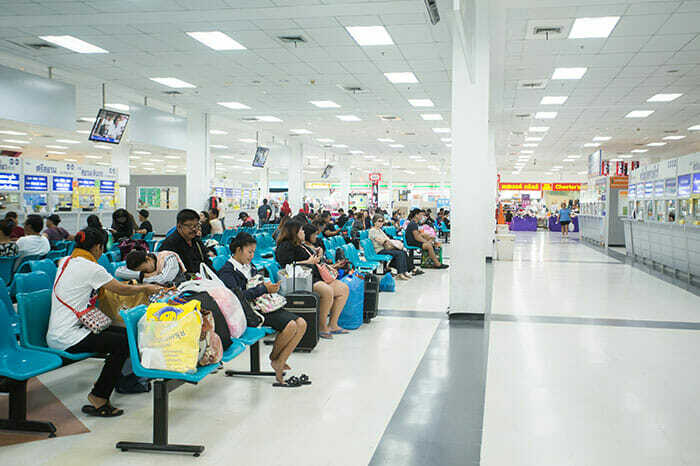 Hat Yai International Airport is 15 kilometers (9 miles) from the city center and there are few different ways to travel from the airport into the city: taxi, airport limo, public vans, and songthaews. With so many different options for your travel from Bangkok to Hat Yai, you can pick which one suits your timescale and budget, and whether you’d like to watch the passing scenery along the way!